What are the minimum ordering requirements? What can I expect after I place an order? What is your 30-Day Guarantee and Return Policy? Can BookFactory make custom books? How long does it take to produce custom books? Does BookFactory offer discounts for volume purchases? What other products does BookFactory sell? What does it actually mean when your Website says "168 pages?" What is the difference between BookFactory laboratory notebooks and Boorum and Pease laboratory notebooks? How environmentally responsible is BookFactory? What if I have additional questions or suggestions? BookFactory offers multiple ordering options to suit your preference. First, orders can be placed over the phone; simply call us at (937) 226-7100 in North America or on +44 (0)20 3137 7038 outside North America to speak to a live representative who will assist you in making your purchase. Next, you may place your order via fax using the Fax Order Form. Finally, orders can be conveniently placed through the BookFactory Website. BookFactory's revolutionary approach to notebook production allows for orders of virtually any quantity to receive great pricing. For standard book orders, the purchasing quantity can be as low as one book. For custom book orders, the purchasing quantity can be as low as ten to fifty books. 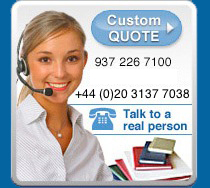 Please call us at (937) 226-7100 in North America or on +44 (0)20 3137 7038 outside North America to receive a quote on your specific custom book order requirements. Next, you will receive a Shipment Notification E-mail from your carrier containing information about your package and a link to use to track the status of your purchase. BookFactory will also send you a confirmation e-mail after your package has been shipped. Orders for in-stock items placed before 10:00 a.m. Eastern Time Monday-Friday will be shipped that day. We do not ship on U.S. holidays or on weekends. Your credit card will not be charged until your order physically leaves our distribution center. Yes, we can ship anywhere in the world via UPS WORLDWIDE EXPEDITED® door-to-door (DDU). You can easily track your purchase by checking your e-mail and following the link to the carrier's Website. With this feature, you can track your package all the way from our factory to your door! The day on which you receive your package depends on the shipping option you choose at checkout. Delivery time can also vary depending upon the city you live in or upon the day you place your order. For example, BookFactory does not ship orders on U.S. holidays or on weekends. If you choose to place your order via two-day shipping on a Thursday and the following Monday is a holiday, then you will receive your order on Tuesday, the second business day. For detailed information on all of the shipment options available to you, check the carrier's Website. At BookFactory, we strive to ensure the total satisfaction of our customers. If for any reason you are dissatisfied with our products, then you can contact us within 30 days of your purchase to return your items and receive a full refund. Simply call us or fill out the Customer Support Form to receive an authorization number and instructions on how to make your return. Note: Personalized or custom-numbered books are non-refundable. BookFactory specializes in the design, printing, and binding of custom laboratory notebooks, log books, engineering notebooks, record books, and branded notebooks. Our build-to-order books are manufactured to fit your unique needs and are delivered to you in record time at a price far less than what is offered by competitors. Because BookFactory does all the design, printing, and binding in one location we can typically produce custom books in only three weeks; however, it is sometimes possible for us to work to tighter deadlines, if required. Yes, Bookfactory offers special pricing for volume purchases of both standard and custom books. BookFactory specializes in the manufacturing of quality notebooks, lab books, and log books. However, BookFactory also sells two complimentary products, archival quality pens and BookSlings. Our page lengths are stated in terms of the total pages contained in a book. A page is considered to be a printed side of a leaf or a sheet of paper. For example, a 168 page laboratory notebook contains a total of 168 front and back pages, starting with six pages devoted to a table of contents and followed by 162 numbered pages devoted to documentation. A log book not including a table of contents would contain 168 numbered pages, or 84 sheets of paper (leaves) printed front and back. Note: Duplicator books are printed single-sided, so each page is on a separate sheet of paper. The biggest difference between BookFactory laboratory notebooks and Boorum and Pease laboratory notebooks is quality. BookFactory notebooks are made with both higher quality binding and binding materials and higher quality paper. Further, BookFactory books feature Smyth-sewn engineering, making them much more usable and durable. Bookfactory also offers customization options that Boorum and Pease does not, such as title stamping, logo stamping, and book numbering. Finally, BookFactory notebooks cost a fraction of what Boorum and Pease notebooks cost. Click here to view a side by side comparison. BookFactory takes environmental responsibility very seriously; we take many steps to ensure our ecological friendliness. First, we use acid free, archival safe paper in the production of our books. Second, we manufacture our paper using biogas energy. Finally, we engage in an extensive recycling program. At BookFactory, environmental consciousness is a way of life. BookFactory's main office is located in Dayton, OH near the University of Dayton Arena. Our address is 2302 S. Edwin C. Moses Blvd. We also have an office London, UK. At BookFactory, we value our customers and believe that their insight into the utility of our product is the best resource for improving and developing products to better fit the needs of dynamic and demanding environments. To ask a question or make a suggestion, fill out a Customer Support Form or refer to our Contact Us page to speak to us directly. We look forward to answering your inquiries and seeing your suggestions!